Hi all, It’s Mera and Katie writing in tandem again! A few days ago we were talking about ideas for Opal’s playroom and started putting together photos that illustrated our thoughts. 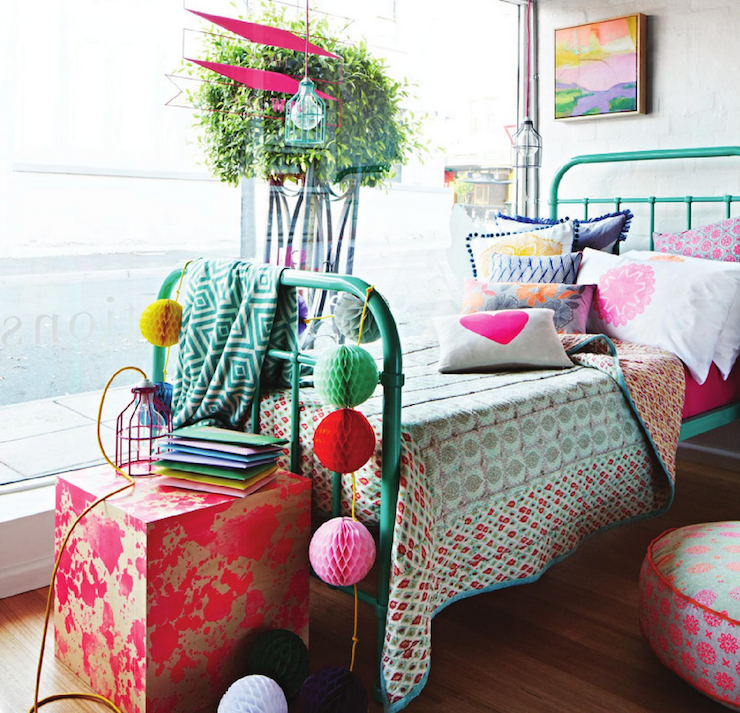 Once we started it was hard to stop – there are a lot of inspiring children’s rooms! At their best, they’re whimsical, colorful, creative and fun – just remove of a couple of stuffed animals (or not – your choice), and it’s a look that definitely works in the rest of the house too. 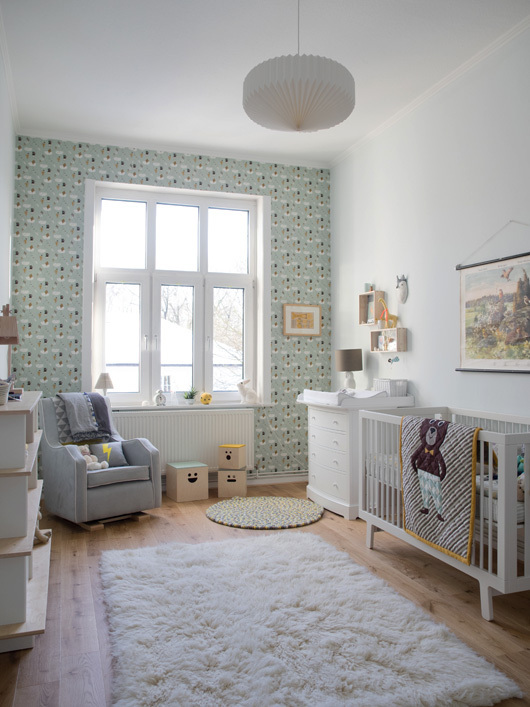 Many of our favorites feature neutral walls (usually white) with lots of colored textiles layered in, though there are beautiful examples of wallpapered rooms too. 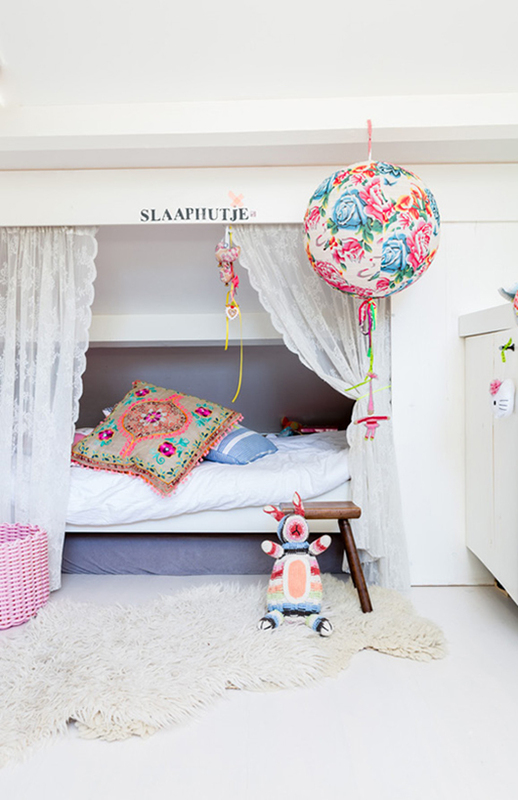 We’re excited to share this collection of children’s rooms that we wish were our own! Which one is your favorite? Katie is crazy about the gorgeous turquoise wallpaper with hits of pink in the second-to-last room and Mera’s favorite is the first room with the big antique armoire. Hope you’re having a terrific Monday; come back on Wednesday for a new post from Katie! 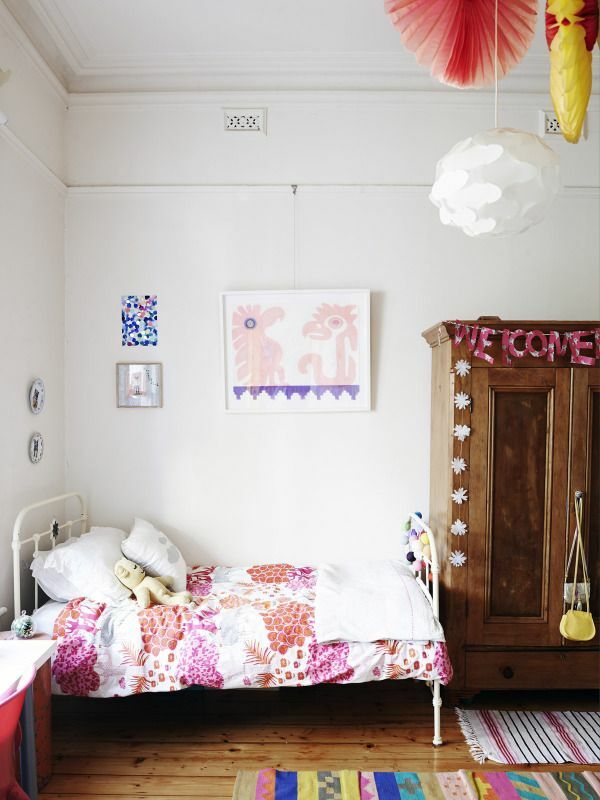 My favourite of the rooms you feature is the one with the wooden floor with seat cushions. It has a lovely, cosy, vibe that appeals to me. It is probably a positive but my boys have very strong views about their bedrooms so we have compromised over how they are decorated. I do, however, wish they would keep them as tidy as these photos depict. I like that room a lot too–the stuffed camel is so cute! 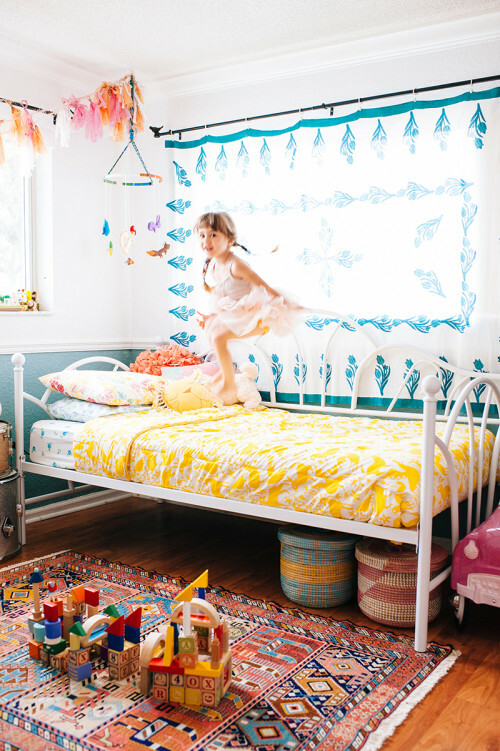 My own childhood room had a castle-like loft bed, monkey bars, and flowers painted on the walls (my parents’ were all about self-expression). I loved that room, and I can only hope that Opal’s journey of self-expression will involve neutral walls, rich textiles, and an overwhelming desire for cleanliness! A mom can dream . 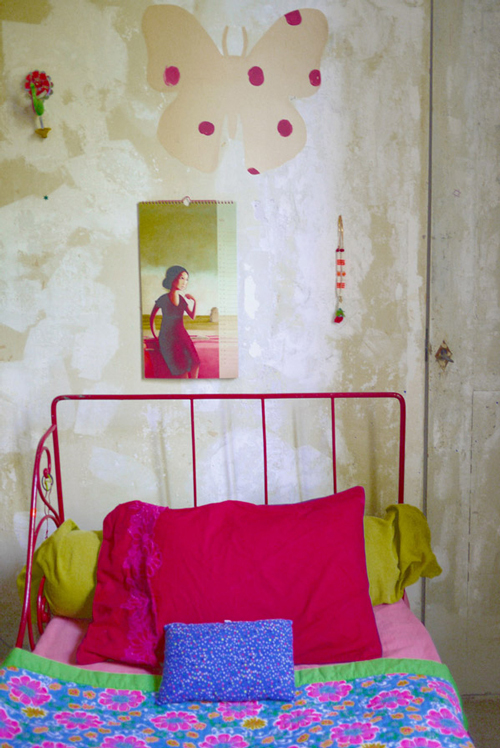 . .
My favorite is the little bed under the eaves with the curtains—the bed of my childhood dreams had curtains. 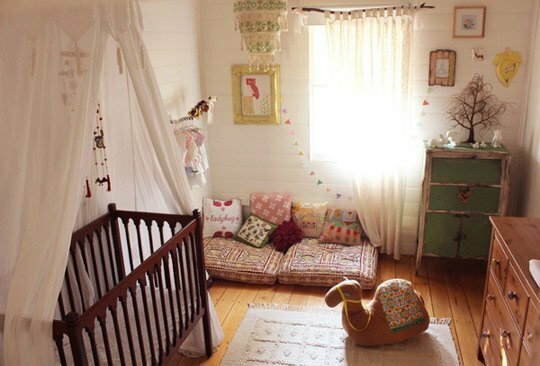 I like all of these rooms though and their lack of real child clutter! 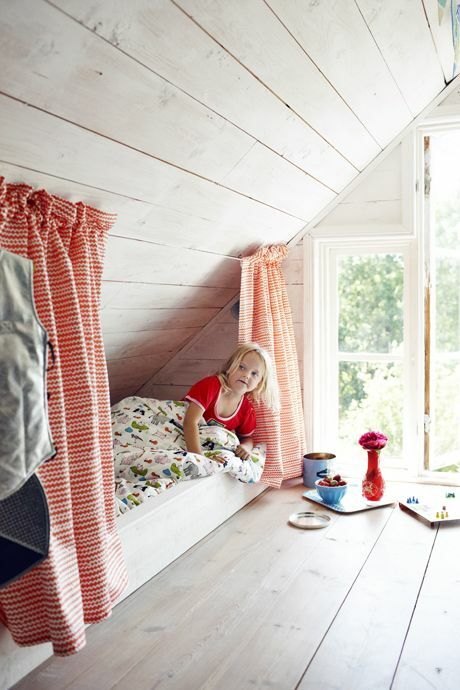 That’s such a sweet use of space – I love little nooks like that. I was remembering the clutter and how important it was to have a big, open shelved cupboard with a lot of baskets for tossing the end of the day’s collection. When Katie was little we lived in a 1911 grand old house and both her older sister and her rooms opened out on to a screened porch each room with its own set of small paned French doors. Katie’s closet had a window and a little sink. All there in the original design. They weren’t big rooms. We had area rugs on the old fir floors so that there was somewhere warm and soft to play. But, they played in those rooms mostly when friends and cousins came. Often there were toys somewhere near me wherever I was! Pretty and practical so you’re not frustrated if it isn’t “picture perfect” – That’s my advice. I have lovely, hazy memories of that house, and do remember the sink in my room and the screened porch. xo my dear mom. Good Score, the Spooky Edition!